The Romance Dish: Lyons, Tigers and Bears, Oh My! Today, it's my pleasure to welcome fellow reader and blogger, Kim to The Romance Dish! Kim is a military spouse, romance blogger, and lover of all things Scottish. She embraces life in the Pacific, especially since the Scots have influenced the Hawaii’s culture. Be sure to check out Kim's blogs, http://www.sosaloha.blogspot.com/ and http://alohaonmymind.blogspot.com/. 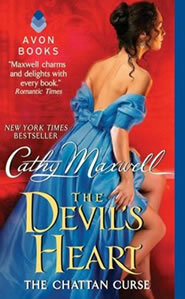 Kim joins us today to talk about the newest historical romance from Cathy Maxwell, THE DEVIL'S HEART. Lyons, Tigers, and Bears, Oh My! Fast forward to the 18th century with the Chattan Family in the Regency London. The Chattan siblings – Neal, Harry, and Margaret – watched their father die when he fell in love with his second wife. Taking head to the curse, Neal, Lord Lyon, seeks a bride who he cannot love in LYON’S BRIDE, Book 1. Yet he falls in love with his matchmaker. Lyon’s faith in love inspires his brother, Harry, to emerge from his drunken stupor to search for the long dead witch. in THE SCOTTISH WITCH, Book 2. Harry is a tiger of the family – a warrior decorated for his valor during the Napoleonic Wars. Yet no armor can protect his heart when he falls in love with a desperate woman posing as a witch. Both brothers succumb to the curse, prompting Margaret to take action. She, too, travels to the Highlands, transforming from an English heiress to sister bear. She challenges the Macnachtan Laird, the last male descendant in THE DEVIL’S HEART, Book 3. This trilogy spotlights Cathy’s strength in exploring relationships. And the romantic relationship in THE DEVIL’S HEART is pure genius. Margaret is a refined lady who becomes emotionally entangled in the century’s old curse. Heath is the pragmatic laird trying to modernize his poor clan. Their mutual attraction leads them to realize their fated love threatens the wich's final revenge against the Chattan Family. Cathy delivers a heart pounding climax that defines true love … and requires a box of tissues. They call her the Unattainable. Lady Margaret Chattan spurned every suitor for her hand, vowing never to marry. The only way to break the curse plaguing her family for two centuries is this ultimate sacrifice. But now her brothers' lives are in danger. Determined to save them, she risks her very soul by traveling into the heart of the highlands to battle a force that has transcended time. Wish I could have attended RT and met Cathy and all the other authors. I can't believe I haven't even begun to read this trilogy yet. My ideal kind of read though. Me too, Mary. I have all three books and am planning to dive in during a very long plane ride I have coming up this summer. Cathy Maxwell is one of my favorite authors and this is on my "To Pick Up" list!! Hope you enjoy it, Betty! This newest book by Cathy Maxwell looks like an emotional story. Thanks for the giveaway! Great review! I want to run out and buy this trilogy. I want to learn more about this evil curse and how it affected Neal and Harry's relationships. Margaret and Heath face it down as they succumb to love. Very interesting premise! I want to read them all! Your enthusiasm makes me want to read all three books again, Kim. I think this trilogy is Cathy Maxwell's finest work. These books are keepers. Hi, Kim! :) Another review of Cathy's book! :) I really have to start reading her books! Hi Kim, It's lovely to see you here. I enjoy Cathy's books, and adore anything Scottish. I've read the other two books in this series, which I thoroughly enjoyed. I would love to read "The Devil's Heart" to conclude the trilogy. Thank you so very much for this opportunity to win. I haven't read a good Scottish historical in a long time. I need to change that. I haven't read any of Cathy's books yet, but I think I may have one in my TBR pile. Hi Kim, great review. I love to read Cathy's books but I'm ashamed to say, I haven't had a chance to start it yet. Any book that is set in Scotland always interests me. Thanks for the giveaway, love yours and Mary's blog:)! It's good to have you visiting The Romance Dish today. I'm looking forward to reading Cathy's newest. Hi, Kim! You always have wonderful recommendations and this looks like another good one! Love those highlanders! Thanks for the review of this trilogy! I hope to get to all of the books soon. For some reason I have not read any of Cathy's books, though I have a few on my wishlist. This new one sounds pretty great too. Looks like some great books here. I love the cover on Cathy's book, its beautiful. Hi, Kim and PJ! I love Cathy's books. Thanks for the giveaway! I have heard so many good things about Cathy Maxwell! Thank you for a great blog; I'll be adding more of her books to my TBR list! Cathy Maxwell is a wonderful author!! Thanks for the giveaway! I absolutely loved the first two books in this trilogy and can't wait to read THE DEVIL'S HEART! I put off purchasing it in the hope I'll win a copy, LOL, but no matter what I will be getting this book. I've been to an RT book signing when RT was in Orlando, plus a couple of RWA book signings, and have met a great number of authors. Cathy Maxwell is one author I haven't had the pleasure of meeting, but I hope I get the chance one day. I think her work is fantastic and she seems like such a lovely lady. Looking forward to reading this newest book, it sounds wonderful. I have enjoyed Cathy's books over the years and look forward to reading this trilogy. Scottish set stories are a favorite and I know I'll enjoy them all and THE DEVIL'S HEART sounds especially intriguing. Thanks for the review and the heads up on the series.